I have often seen glories which appeared to be elliptical (and not circular) or vertically disrupted. This was always caused by the projection onto an uneven cloud cover. But on November 18, 2007, I could observe a “vaulted” glory from Mt Wendelstein (1835m) in the Bavarian Alps. The strange glory appeared in an isolated stratocumulus cloud which adapted to the shape of a mountain. Its colours ended irregularly on its outer fringe like those of a glory around the sun which pass over to cloud iridescence. There is no circular shape recognizable in the colours outside the inner glory rings. The pictures are taken using a polarization filter and the contrast has been increased. Another observation which might be related to mine, has been made on January 01, 2007 by Stefan Rubach on Mt Großer Arber. 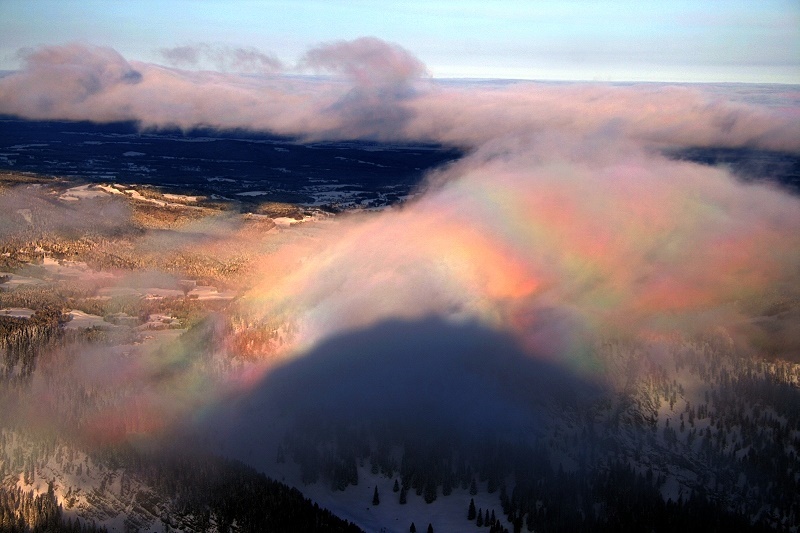 Posted on May 15, 2011, in glory and spectre of Brocken, observations and tagged glory, glory iridescence, Mt. Wendelstein. Bookmark the permalink. 2 Comments.